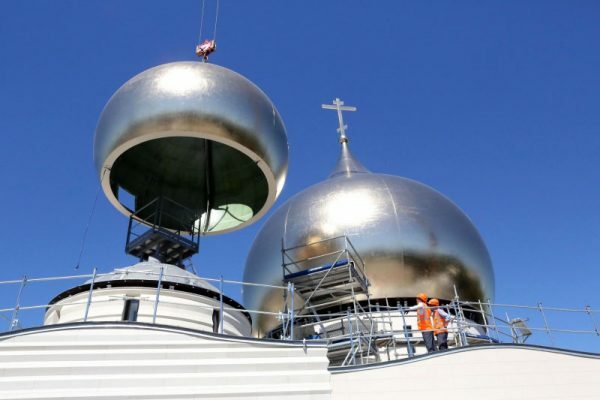 On August 24, 2016, four lesser cupolas were installed in a solemn ceremony on the Cathedral of the Trinity under construction on the Branley Embankment in Paris. The cupolas and crosses were blessed by Bishop Nestor, administrator of the Diocese of Chersonese, on March 19, 2016, before the main cupola was installed. The event was attended by the Russian Ambassador in France Alexander Orlov, staff members of the Russian diplomatic mission in Paris, representatives of the French construction contracting company Bouygues, and representatives of this company headed by the chief architect of the cathedral, Mr. Jean-Michel Wilmot. The delegation of the Diocese of Chersonese was led by Rev. Maxim Politov, secretary of the diocesan administration. With this ceremony the final stage of the exterior decoration of the diocese of Chersonese’s new cathedral in Paris was completed.